Australia isn’t the first place that comes to mind when most people think “cookstoves,” with the continent being in the southern hemisphere and filled with desert. 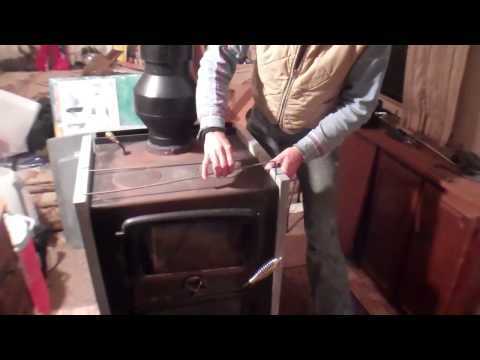 Yet, that’s where we first found the Bakers Oven, a small cookstove compared to many on the market, but what it lacks in size it makes up for in reliability and functionality, making it the perfect stove for a cozy cabin or any home with limited space. 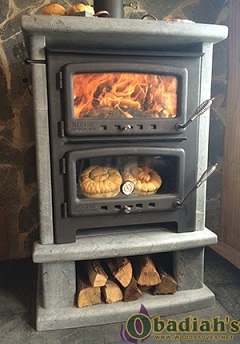 Most wood cookstoves have pretty much the same design and function: Firebox on the left, oven on the right, and a cooktop. 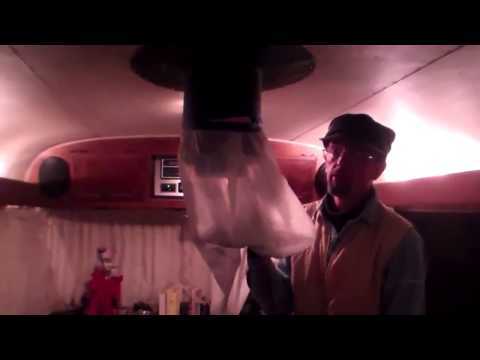 For most people this works perfectly, but even before the “tiny house” craze began sweeping across the nation, there were many people seeking a stove with a smaller footprint. 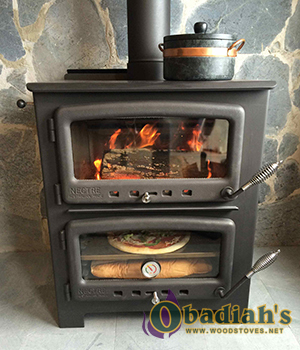 With that in mind, Obadiah’s made contact with Pecan Engineering in Australia, which was manufacturing the stove at the time. 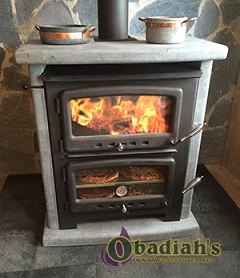 Soon after, Obadiah’s began working with a Canadian manufacturer to bring the stoves to North America and they sold like hot cakes, given their sub-$1000 price-tag and the lack of other small stoves on the market. In the years since we first started bringing the Bakers Oven to the U.S., the stove has gained a UL listing and now comes in two sizes. The price has gone up as well, but the Bakers Oven is still a great option for those who are tight on space but crave a wood cookstove. 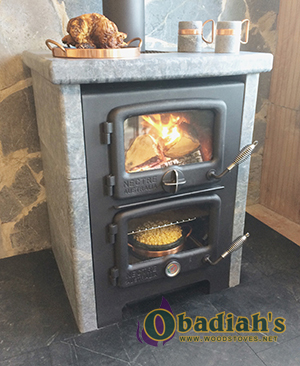 The Bakers Oven is more than just a compact cookstove, however, as it offers a feature found in hardly any other stove on the market: Soapstone veneer. Having some leftovers from a soapstone fireplace we had just installed, we experimented with wrapping it around the Bakers Oven. The difference was amazing: See, soapstone is a natural rock that is widely known for its ability to retain and radiate heat, which means that even after your fire goes out, the stone will still be warming your living space. Think of it like a battery for storing heat, and the heavier the soapstone, the more heat it can store. The best part about soapstone is that the surface temperature never reaches the uncomfortable, extremely dangerous levels that steel or cast iron will. 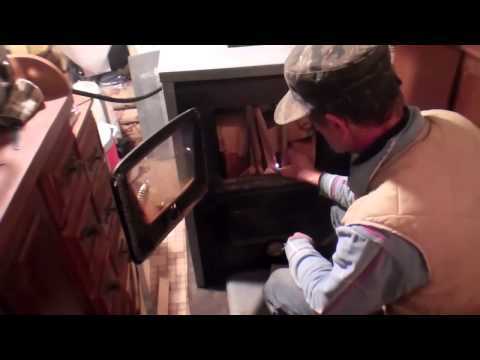 Instead, it gradually reaches temperatures that allow you to sit relatively close to the fire without the risk of scorching your eyebrows off, and it maintains that temperature for much longer than any other material commonly found on cookstove exteriors. 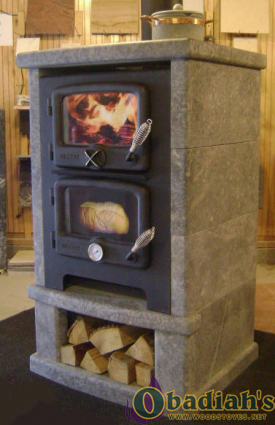 Later, a soapstone supplier from Vermont called us attempting to track down the individual who sold us the Soapstone fireplace, and an idea was formed that later developed into reality: A soapstone cookstove. 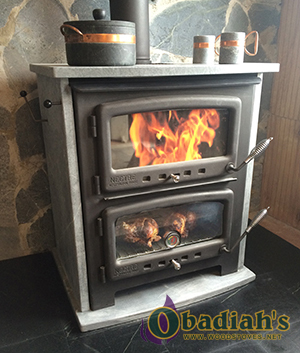 It was a huge hit, and became so popular that Obadiah’s now offers a variety of soapstone configurations for both the original and XL sizes of the Bakers Oven. Now, chances are you’ve heard the Bakers Oven referred to by several different names. 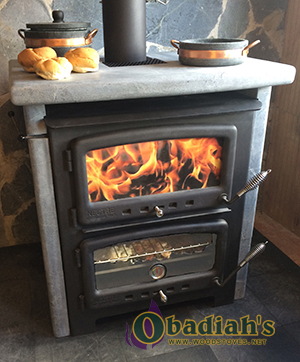 Years ago, Obadiah’s soapstone supplier decided to re-brand the Bakers Oven as the “Bun Baker.” The Bun Baker is exactly the same stove as the Bakers Oven, but with soapstone included. So if you find the names confusing, just remember: The Bun Baker includes soapstone, the Bakers Oven does not. Both the Bun Baker and the Bun Baker XL feature soapstone options, and all units in both lines are EPA and Washington State approved. The original Bakers Oven is a beautiful small cookstove with a traditional look and plenty of options for whipping up a meal. Despite its size, the Bakers Oven has enough room for up to four large pots on its surprisingly spacious cooktop and an oven with a removable oven rack that allows plenty of room for baking bread, among many other potential meals. The Bakers Oven has a small footprint designed for tight spaces, with a bottom and rear heat shield included that reduces the amount of clearance you need between the stove and combustible materials. 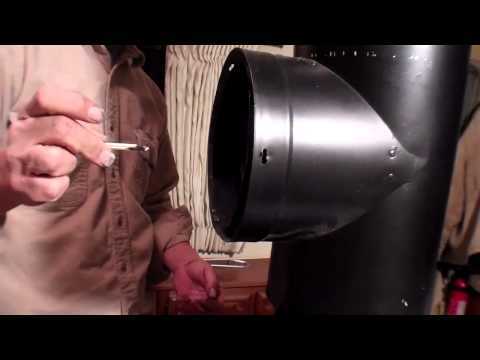 Even so, this cookstove still puts out over 30,000 BTUs an hour, an excellent amount for its size and enough to comfortably heat any space up to 1,0000 square feet. It’s also constructed from quality, heavy welded steel plates, so you can count on its durability over the years. 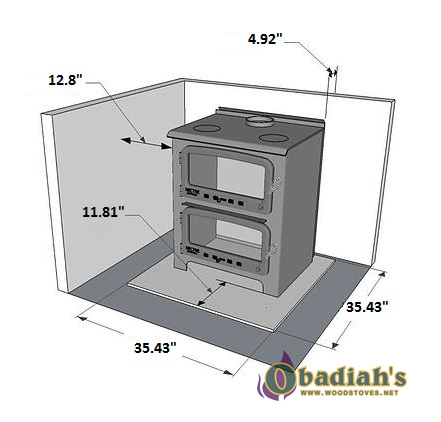 We like to think the Bakers Oven is a great fit for small retreats: Whether it’s a small home, cabin, or even a travel coach as Obadiah’s once used, the Bun Baker is very versatile when it comes to installations in tight quarters. There are a few things worth noting, however: First, the firebox is somewhat small and requires wood to be 12″ or less in length. This is a painted stove and, as a result, it requires a fair amount of attention to keep it clean. The oven is also painted, causing the same cleaning difficulties as the exterior, and will emit fumes until fully cured. 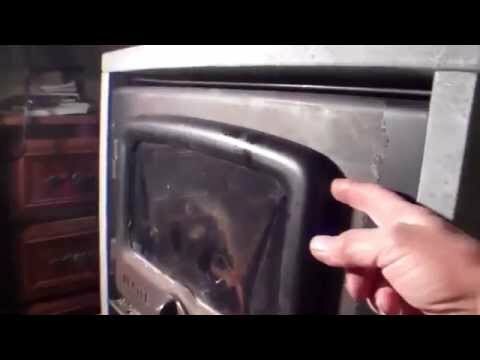 These issues don’t impact the greater functionality of the stove, but please keep them in mind if you’re considering purchasing a Bakers Oven. Bun Baker 650: Adds a simple, beautiful 1.25″ Soapstone Veneer. 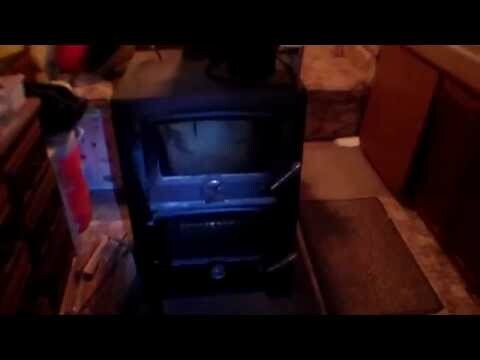 Bun Baker 750: 1.25″ Soapstone Veneer and hearth (soapstone platform that the stove sits on). Bun Baker 1000: Thick, 2 3/8″ Soapstone Veneer for better stone heat retention. 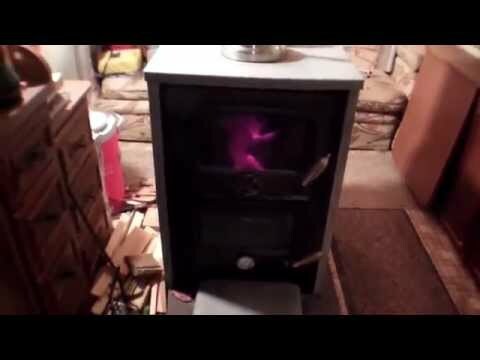 Bun Baker 1200: 2 3/8″ Soapstone Veneer and hearth. 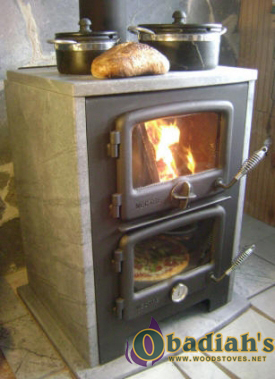 Bun Baker 1500: 2 3/8″ Soapstone Veneer, hearth, and a convenient wood storage pedestal between the stove and the hearth. Do you like the Bakers Oven line and have plenty of room? Then the Bun Baker XL might be right up your alley. With an oven and cooktop fit for a family-sized meal, you’ll have even more cooking options with the XL series. The cooktop features two removable rings for wok cooking, the oven offers a superb amount of width along with a removable rack, and with even more heat than the original Bun Baker line, you can be sure that your meals will cook faster and more efficiently. With its larger firebox, the Bun Baker XL puts out up to 65,000 BTUs an hour, meaning it can heat more than double the area that the Bakers Oven does, and making it better suited for larger living spaces. Bun Baker XL 850: Adds a simple, beautiful 1.25″ Soapstone Veneer. 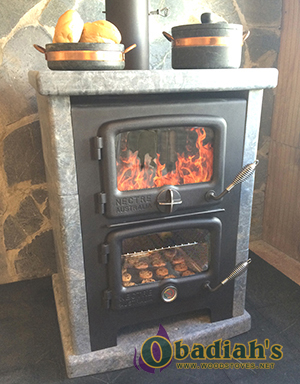 Bun Baker XL 950: 1.25″ Soapstone Veneer and hearth (soapstone platform that the stove sits on). Bun Baker XL 1600: Thick, 2 3/8″ Soapstone Veneer for better stone heat retention. 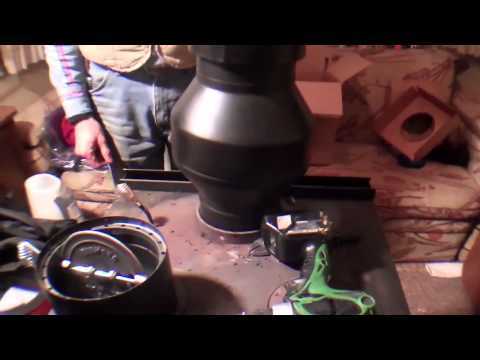 Bun Baker XL 2000: 2 3/8″ Soapstone Veneer and hearth. 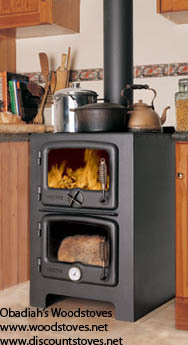 Bun Baker XL 2500: 2 3/8″ Soapstone Veneer, hearth, and a convenient wood storage pedestal between the stove and the hearth. 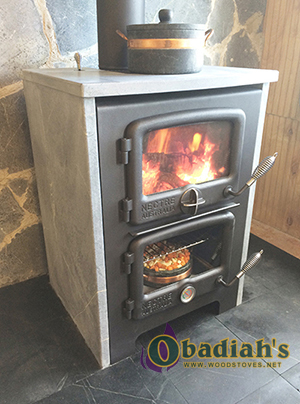 Obadiah's Woody Chain goes over a Baker's Oven Cookstove that has been converted into a Vermont Bun Baker with a soapstone installation. 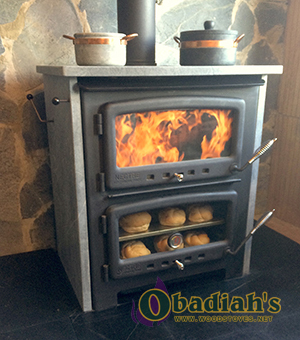 Bakers Oven and Bun Bakers Cookstoves and more can be found at Obadiah’s Woodstoves and Alternative Energy!